2 - 4..................Kitty von Hagenstolz. 3,3 - 5...............Dina von Klockenhof. 3 - 4,5...............Alf von Hagenfreund. 3 - 5..................Amor vom Haus Bormes. 4,4,4 - 5,5.........Alex von Kleinwaldheim. 4 - 5..................Amsel von Hagenstolz. “Odin was a short, compact male. He was very powerful and had strong heavy bones. His head was correct but could have been a bit longer. His coat was very thick with long hair. His progeny sometimes still have long, thick hair. His temperament was reasonable. He received his Schutzhund I with 95-79-80=254 points and his Schutzhund II with 94-81-89=264 points which was good. His 'Kampftrieb' and his nerve were normal not excellent. In the showring he had more success. 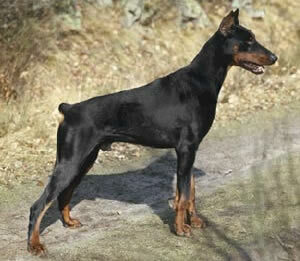 He became an international champion, champion on Monaco and was best dog of all breeds in Germany. He was the father of the important sire, Chico von Forell and was exported to Japan.